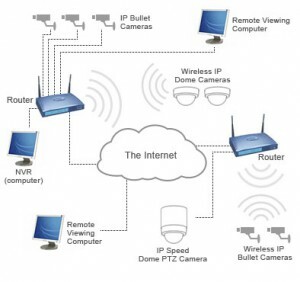 An IP camera is a stand-alone device that is a camera and computer combined into one unit. Everything required for viewing images over the network is built into the unit. The IP camera has its own IP address and built-in software for a web server, FTP (File Transfer Protocol) server, FTP client, e-mail client, and alarm management. Other features may include communications for motion detection, and mechanisms for pan, tilt, and zoom control. Advances in technology make the IP camera unique. Like a conventional camera, a series of lenses capture and focus beams of light to create an image of a scene. Instead of focusing this light onto fi lm, it fi lters the color and focuses the image onto an image sensor located just behind the camera’s lens. It then scans the image and generates a video signal. Once the image is captured, DSP (digital signal processor) technology manipulates the video data, enabling the processing of advanced algorithms such as motion detection, window blanking, and more. An encoder, commonly called a video server, converts the analog signal into a network-based format, where the image is compressed before being sent out over the network as live video streams. Network CCTV IP cameras connect to a computer network. They each have respective nodes, or network addresses, and act as video servers on the network. This allows a user to view the video from any computer equipped with a web browser such as Internet Explorer. No special cables are required; network cameras can plug in to any computer jack available on the local network. Surveillance can thus be handled remotely from anywhere in the world, so long as a user knows the IP address of the camera. Numerous protocols are used depending on the make and model of the camera, including TCP/IP, HTTP, and FTP.